At least 15 lawyers, and judges and prosecutors who were earlier removed from their offices as part of the government’s post-coup crackdown were detained on Jan 1. 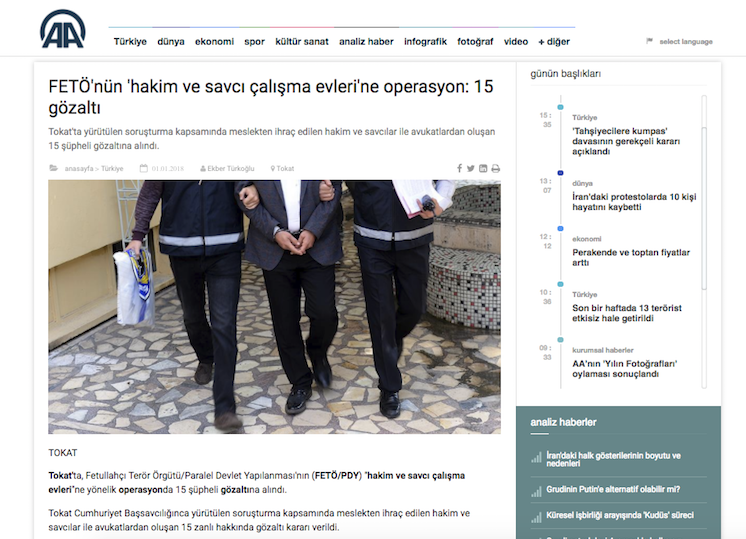 State-run Anadolu news agency said Monday that police carried out operations in several provinces and detained 15 suspects sought by the Tokat Public Prosecutor’s Office. The detainees are accused of links to the Gulen movement. Turkish government blames the movement for the July 15, 2016 coup attempt while the latter denies involvement. The government considers the movement as a terrorist organization and has arrested more than 60,000 people over ties to the group, among them many judges and prosecutors as well as lawyers.